World Castle (called Castle World on Miiverse) is the seventh world of Super Mario 3D World. It is a large lava filled world, taking place in Bowser's Castle, above every preceding world, but below World Bowser, with ? Blocks and Coins are scattered throughout the map. It contains seven standard courses, three Enemy Battles, a Toad House, a Captain Toad course, a Castle, and a Sprixie House. After completing the castle, Bowser will kidnap the Sprixie Princesses, including the just-rescued red one, and will use their power to create a sparkling Clear Pipe to World Bowser. World Castle -1 Fort Fire Bros. A blue lava-filled course with Fire Bros.
World Castle -2 Switchblack Ruins An underground course with Switch Panels. World Castle -3 Red-Hot Run A 100 second level with Dash Panels. World Castle -4 Boiling Blue Bully Belt A course with Bullies and blue lava. World Castle -A Brolder Blockade Is Back A blockade featuring Brolders and Boss Brolder. World Castle -B Prince Bully Blockade Is Back A blockade featuring Prince Bully. This time he shoots out three blue fireballs at a time and his shoes are blue. World Castle -C Fire Bros. Hideout #4 The final Enemy Battle of the game with seven Fire Bros.
World Castle -5 Trick Trap Tower A tower with Thwomps. World Castle -6 Rammerhead Reef A water course with Rammerheads. World Castle -7 Simmering Lava Lake A lava course with rising and sinking lava. 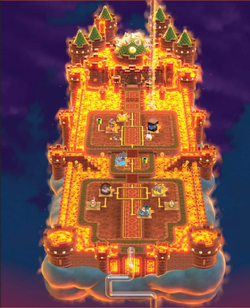 World Castle -Castle Bowser's Lava Lake Keep A lava course featuring the second encounter with Bowser. World Castle - Captain Toad Captain Toad Gets Thwomped The Captain Toad course of World Castle. World Castle - Sprixie House Sprixie House A Sprixie in the Sprixie House gives the player a Stamp. This page was last edited on March 10, 2019, at 01:37.